J. V. Fesko., Word, Water, and Spirit: A Reformed Perspective on Baptism. (Grand Rapids, Michigan: Reformation Heritage Books, 2010), 451 pages, $25.00. J.V. 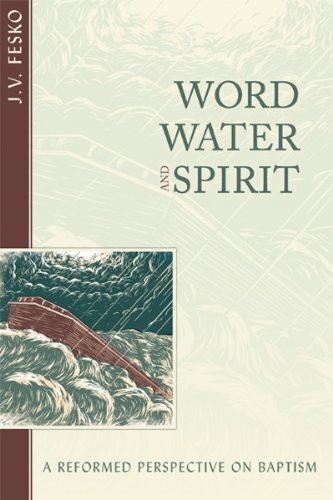 Fesko’s work, Word, Water, and Spirit is a robust exposition of the Church’s understanding of baptism and the Lord’s Supper. Fesko clearly defines in this work the sacrament of baptism from Biblical, theological, ecclesiological, covenantal, and historical standpoints. From there, Fesko shows his own theological convictions of the subject and the sacraments as a whole. Fesko takes great strides to makes it abundantly clear that the goal of his work is to lay the foundation of the history of the sacraments (specifically, baptism), and from there, explain what baptism “means, define it, and identify to whom it should be administered,” in light of the theological and covenantal places that baptism holds in the church. Hence, he views the history of the sacrament(s) as a necessary component to the study. To accomplish this task, Fesko dedicates Part 1 of the book to the history of baptism within the Reformed church, followed by Part 2 with a biblical-theological study of baptism, and ends with Part 3, a systematic theological study of baptism. Part 1 covers the sacrament of baptism within redemptive history, highlighting what he views as the most influential events that shaped the church’s understanding of the sacrament in the church. To accomplish this study, Fesko highlights key schisms, councils, and theologians from all areas of Christendom. It is through this very simple (some sections shorter than a page) yet substantial historical approach that Fesko aptly paints the history of the sacraments, and specifically baptism. Fesko wishes to enlighten the reader on the importance of the covenantal context of baptism -- that is to say, baptism is entirely covenantally directed (man’s covenant with Christ, and man’s covenant with the body of Christ). Beginning with a historical background on Augustine’s position on baptism, Fesko notes that he was one of the first who articulated what the Scriptures already taught regarding the covenantal focus of baptism (23). From Augustine, Fesko transitions the reader into a medieval understanding of baptism. Many of Aquinas’ contemporaries held to Augustine’s understanding of the (partial) salvific powers of baptism for infants. In short, the Patristic era’s focus was on “the miraculous power of the water itself” (25), and the medieval era focused on “a substance infused” (42). Both eras, Patristic and Medieval, greatly impacted the modern Church’s as a whole understanding of the sacraments, and most specifically baptism. Following the sacramentology of the Medieval era, Fesko continues with the herculean task of explaining for the reader the sacramentology of Luther (ch. 2), Zwingli (ch. 3), Calvin (ch. 4), the Early Orthodox Reformed (ch. 5), High Orthodox reformed (ch. 6), and ending the historical overview with modern theologians. Though chapters 3-5, the reader sees the impact of three of the some of the most influential theologians in the church’s history, (for better and worse). Beginning with Luther, Fesko explains the significance of Luther’s understanding of sola fide, and as such a hearty swing at the church’s understanding of baptismal regeneration. Interestingly, Fesko notes the connections between Luther’s sacramentology and his eschatology. As Fesko aptly puts it, “Luther saw the already/not yet tension in baptism” (56), an aspect that Fesko will expound further on in Part 2. Touching briefly on the influence of Zwingli and the Anabaptists, Fesko gives a generous defense of Zwingli (76), a rare sight in many reformed circles today, while stating equally clearly the ways in which Zwingli erred from the standard Reformed traditions, specifically concerning his definition of the sacraments as a whole. Following Zwingli’s impact upon the church, Fesko focuses upon John Calvin as the apex of Reformed sacramentology. This chapter is split in half -- half explores Calvin’s sacramentology, and the other half explores the historic development of Baptist sacramentology, specifically credobaptism. From here, Fesko’s notes several key things: Calvin’s emphasis on the sign and the thing signified (88), that baptism was connected to sanctification (not regeneration), and that baptism is intimately tied to ecclesiology. For Calvin, baptism is a confirmation of faith (89) and a symbol of adoption (92), as well as other things. In short, he defined it as an “outward sign by which the Lord seals on our consciences the promises of his good will toward us in order to sustain the weakness of our faith, and we in turn attest our piety toward him [...].” Next, Fesko shows the validity of Calvin’s sacramentology, and its influence on later developments in sacramentology, specifically concerning the harmony found between Calvin’s sacramentology and Reformed confessions and catechisms, specifically the Belgic Confession and Heidelberg Catechism. Fesko continues to take the reader to the times of many lesser known theologians during the time of Early Orthodox Reformed history. Here in a ‘duo’ chapter of sorts, Fesko’s highlights the lives of three theologians -- Amandus Polanus, Johannes Wollebius, and William Ames. The chapter ends with a study of the 39 Articles and Irish Articles -- both sources for the creation of the Westminster Standards, the written pinnacle of Reformed dogma. Ending Part 1, the reader sees again the emphasis of showing the extreme continuity in the church concerning baptismal regeneration, the sacraments as signs and seals, and then at the latter part of the chapter, extreme disunity in Christendom as a whole, as seen through Fesko’s analysis of the London Baptist Confession. Part 2 is the shortest section of the book, but in it we see Fesko’s continuation of fulfilling his promise to the reader to expose anew the covenantal aspects of baptism, in light of revealed Scripture. Showing the reader the a few of the varied images Scripture presents a whole picture of baptism for the reader -- showing baptism as new creation, covenantal judgment, and ultimately, eschatological judgment. All three of these aspects are previously mentioned in the works (some with the promises of future explanation in the following chapters). Fesko has done away with simple NT explanations of baptism, but rather delves into a short study of the subject of baptism through all of Scripture -- focusing mainly on the covenantal connections between baptism and the crossing of the Red Sea. Fesko defends the unity of Scripture by showing the continuity of Scripture on baptism throughout both testaments of Scripture -- we see judgement and cleansing through the life of Noah, the Israelites’ crossing of the Red Sea, and similarly in the NT how believers are buried and cleansed through the death of Christ. Ultimately Part 2 shows us that baptism is based on covenant, and based on Christ (400). Part 3 is in many ways Fesko’s attempt to provide a unified, cohesive summary of the previous chapters: Baptism is defined as a “a sacrament, a sacred sign and seal of the covenant of grace.” (395). Baptism is defined for the people of God and their children (ch. 14), and that the church’s understanding of baptism has serious implications for the church’s sacramentology as a whole (evidenced through Fesko’s exposition of paedocommunion, pp. 361-365). In many ways Part 3 is a summation of Fesko’s personal convictions concerning baptism -- which in many ways is simply the outworking of the Reformed teachings of Part 1 and Part 2. There are inklings of repetitiveness found in Part 3 due to this. Fesko, in stating his own beliefs repeats many things the reader at this point already knows, or can safely assume Fesko holds given the context of the work. Attaining the goal of the work has already been done in the previous chapters, and little new is said here that hasn’t been previously stated. Overall, it is sound, Reformed teaching, yet perhaps it is debatable as to how necessary this portion of the text is considering the overall goal of the work. Fesko’s Word, Water, and Spirit is a work that’s greatest strength lies in the fact that it says nothing new. It states history accurately, the doctrine’s consistent to Reformed standards, and stays in perfect alignment with Scripture. Fesko is a careful, methodical writer, a joy for any Reformed Christian to read. His language is simple, and his patterns repetitive, but in a good way. For every area of study, Fesko follows almost identical patterns for the reader to be able to track best with the text. First, Fesko somehow connects the era with its previous one or prior eras. Second, Fesko clearly defines the theologian’s position on the sacrament (usually with a short quote). Third, Fesko expounds on the theologian’s position as a whole, including certain nuances, changes, and particular areas of emphases the theologian had regarding baptism. Fourth and finally, Fesko note particular areas in which the theologian shaped the church’s understanding of the sacrament, short term and long term. Through these four ways, the reader is able to glean a wealth of knowledge from Part 1. In almost every one of these areas of study, Fesko casually notes many common historical misunderstandings, specifically concerning terminology, doctrine, or the long term impact of specific historical events. The second strength of the work lies not only in Fesko’s explanations of the Reformed dogmas, but other’s as well. His defense of the relative orthodoxy of Zwinglianism, explanation of modern theological schisms in the church, and with his examination of paedocommunion are all excellent examples for the Reformed community of how to appropriately engage with other convictions and belief systems. In a very appropriate and gracious way, Fesko examines various ideologies and belief systems against church history and Scripture. There is little to complain about this work regarding theological content -- if anything, Fesko goes too far in examining both of the sacraments, in a work that is titled, Word, Water, and Spirit. Although Fesko makes no promises to only cover the topic of baptism, the length to which he delves into the Eucharist is questionable at minimum. Overall, it would be more beneficial to the reader for Fesko to lay out early on in his work the work’s intended audience. A single read through of the work is all it takes for the reader to confirm this is a highly academic work, not intended for all Christians necessarily, but beneficial to all Reformed Christians should they chose to read it. As well, there are several areas towards the latter half the book that can be confusing for certain readers. If they are not familiarized with the Biblical languages (and loosely with ecclesiastical Latin), interacting with Fesko’s text will become more cumbersome and tiring. At minimum the Biblical languages are daunting, and at most distracting. Ultimately, his work is a worthy read. Through simple explanations, Fesko is able to walk the reader through history, theology, and it is such a testament to the Reformed faith and confessions, that this book is a joy and benefit to readers.